This recipe came to me as I had fixed this with soy sauce, hoisin sause, I wanted a different flavor, so I combined what I had in the fridge, then added and subtracted ingredients, and came up with this. It has been served to many friends and family. While rice is cooking, cut up beef tenderloin. Cook tenderloin in olive oil for just a couple of minutes, on each side, it will be slightly rare. Combine sauce ingredients in a pan, stirring to combine, on medium heat, just until it begins to boil. Add tenderloin to combine all the flavors. When rice is done, plate rice and top with tenderloin sauce mixture. 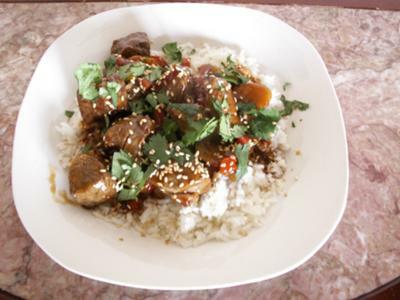 Garnish with cilantro and sesame seeds. Makes 4 servings. Serve & Enjoy! Note: Most items should be found in the oriental section of in the grocery store. I have had a hard time finding the banana sauce lately, but I am limited to few grocery stores, probably found in an Oriental market, but the banana sauce was real good in this recipe!